Staff at Dartmoor Zoo are 'playing the waiting game' this morning (8 July) in anticipation of the safe return of a lynx, that escaped from captivity yesterday. Flaviu the Lynx hasn't been seen since 6 July. Police drones and thermal imaging has been instated to try and locate the missing animal. 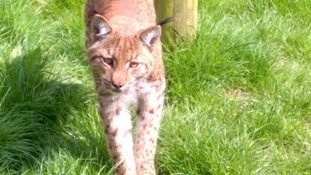 A lynx which escaped from Dartmoor Zoo on 7 July has been found – but has evaded capture and is still on the run.